Perhaps the most serious of the household hazards relates to toxic fumes. Birds have a highly efficient respiratory system in order to absorb the extra oxygen needed to power flight muscles, but any gas will be rapidly absorbed – not just oxygen. That is why canaries were used in coal mines as detectors of methane and carbon monoxide. They would fall off their perches long before these gases built up sufficiently to harm humans. Therefore any noxious material in the atmosphere of the home will affect your birds. Cigarette smoke, scented candles, incense burners, open fires, aerosol sprays – all will cause irritation to your birds’ lungs and air-sacs, and chronic exposure can result in permanent damage. This problem is no better illustrated than by a post-mortem examination I carried out some years ago on a much-loved Amazon parrot. 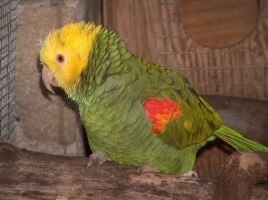 “Popeye” was a mature Yellow Headed Amazon (Amazona ochrocephala oratrix) of some 35 years, and a wonderful character. He had an extensive vocabulary of words, but also sounds such as telephone and door bells, laughing and crying, coughing and sneezing. Unlike many talking birds, he loved an audience, and would go through his repertoire to order. His owner for the last five years of his life was a lovely lady who used Popeye as entertainment at children’s parties, where he was always a great hit because of his mimicry and guaranteed performance. Mrs Hooper was understandably devastated when one day Popeye suddenly fell off his perch and died, with no previous signs of illness. Because of the unexpectedness of this event, and because she had other birds in the house, Mrs Hooper rightly decided to have me carry out a post-mortem examination on her bird. All his air-sac membranes (which should be thin and transparent) were thickened and cloudy, and dotted with black spots of soot. 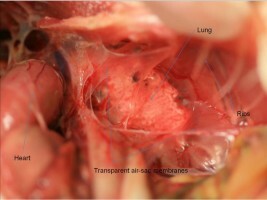 The lungs were congested, and also filled with black spots. This is known as anthracosis, and is the result of accumulation of hydrocarbon particles from cigarette smoke in the respiratory system. In addition, the major vessels leading from the heart were yellow and thickened with fatty deposits, known as atherosclerosis. This obviously has the effect of reducing the diameter and elasticity of these arteries, thus increasing the load on the heart. This pathology is the direct result of the inhalation of tobacco smoke, and Popeye ultimately died of heart failure because of the long-term damage sustained in this way. Mrs Hooper was devastated: she and her family were confirmed non-smokers, how could this have happened? As I have said, Popeye was owned by this family for just the last five years. Questioning revealed that his previous owner had owned a pub, and for the first thirty years of his life, Popeye had lived in the public bar! He was thus subject to passive smoking on a grand scale, with the unfortunate result described. Although he had lived latterly in a clean environment, the damage to his system was already done, with irreversible and fatal consequences. The mostly deadly of toxic fumes are associated with cooking. Over-heated cooking oil will release a blue smoke that will soon cause a parrot to gasp and choke, so be careful of those deep fat fryers and heating the wok for the stir-fry! Self-cleaning ovens that work at high temperatures; new grill pans; or Teflon® - coated saucepans will all – if over-heated or allowed to burn dry – release toxic fumes that will make us cough and our eyes run, but will kill a parrot in minutes. Many times over the years I have seen this happen: parrots perfectly healthy and happy one minute will suddenly start to gasp and cough, then collapse on the floor with wings spread, and die moments later. Post-mortem examination reveals a distinctive bright cherry-red colour to the lungs, as the lung tissue is invaded with red blood cells. 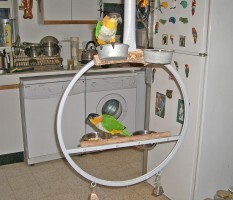 One particular case involved several birds in a household that lived in different rooms. Those nearest the kitchen when a saucepan boiled dry died within five minutes; those in the next room took ten minutes before they succumbed. Of three birds kept upstairs, one died 30 minutes later; the other two survived, but had serious breathing problems for several days afterwards. The home can be a dangerous place for birds!